The Junior League of Washington (JLW) is pleased to announce the posting of the Request for Proposal (RFP) for the League-wide Day of Service on Saturday, April 7, 2018, from 8 a.m. – 2 p.m. Click here for more information and to submit an RFP. 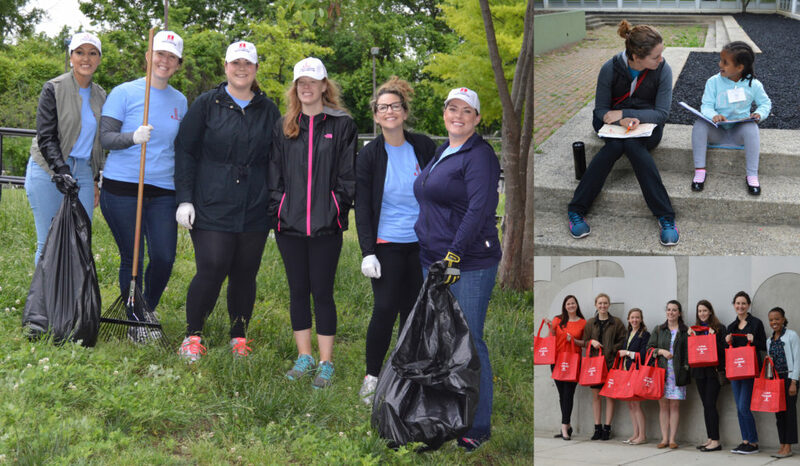 On Saturday, May 6, 2017, the Junior League of Washington (JLW) held our inaugural Day of Service – a volunteer event that engaged our more than 2,300 members, and their friends, spouses, and children, in meaningful projects around the DC community to maximize our impact on a single day. For this Day of Service, JLW selected projects that aligned with our mission and improved the community through the effective action of trained volunteers. Capital Area Food Bank – Volunteers worked with the largest organization in the Washington metro area working to solve hunger and its companion problems by sorting food and packing boxes to send home with those who need good, healthy food. Capital Area Food Bank L Street Mobile Marketplace – Volunteers worked with the L Street Mobile Marketplace, which is hosted by the Capital Area Food Bank in partnership with the Mt. Vernon Triangle Community Improvement District, Unity Healthcare, and the DC Greens Fruit and Vegetable Prescription program, to provide high-need communities in the Mt. Vernon and NOMA neighborhoods with access to seasonal fresh produce, nutrition education, and wrap-around health services. DC Department of Parks and Recreation– Volunteers helped the DC Department of Parks and Recreation get their pool areas ready to open on Memorial Day. Volunteers were stationed at Francis Pool near Dupont Circle and Randall Pool near Navy Yard. DC Public Library – Volunteers participated in the DC Letters About Literature contest at the Watha T. Daniel/Shaw Library. Letters About Literature is a national contest hosted by the Library of Congress, in which students from each state and the District write to the author of a book, story, or poem that has moved them. JLW supported the DC contest by setting up, checking in students, providing and handing out gift bags, and cleaning up after the ceremony. JLW’s volunteers helped honor more than 100 students and their parents for their participation in the contest. Horton’s Kids – Volunteers took part in the Charles Shelton Community Clean-Up. JLW volunteers worked alongside Horton’s Kids staff and Wellington Park residents to clean up the neighborhood’s Community Resource Center, located in the ground floor of an apartment building just steps from participants’ homes and which serves as the cornerstone for Horton’s Kids. JLW participation meant the clean-up covered more ground than in previous years. A Wider Circle – Volunteers helped with Silver Spring-based A Wider Circle’s Neighbor-to-Neighbor program, which provides basic needs items, including furniture, linens, kitchen items, and toys, by sorting donations to ensure A Wider Circle is only redistributing items in dignity condition (free from obvious damage or defect), stocking showrooms, and assisting clients in selecting items to take home. On a single day, a group of volunteers can help A Wider Circle fully furnish between 20 and 30 homes. Please direct any questions about the Day of Service to dayofservice@jlw.org.